At the Bournemouth Parks Foundation we all have one thing in common – we love our parks and open spaces! Our mission is to support, enhance and protect our parks for existing and future generations to come. 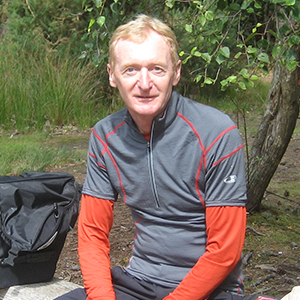 Roger is a very keen cyclist and is deeply embedded in promoting active lifestyles and healthy living having worked as the Director for Leisure at Bournemouth Borough Council for over 37 years. He has now retired from the role but heads up Active Dorset which are a community interest company committed to raising the level of participation in sport and physical activity across Dorset and looks forward to helping ensure our parks and open spaces continue to play a significant role in our natural, social and economic environment of the town. Mark is the creator and Managing Director of the Urban Guild: the Urban Beach boutique hotel, the Urban Reef restaurant on the prom facing the sea at Boscombe Pier, Urban Renaissance Cafe in Russell Cotes and Jenkins & Sons Cafe Bar at Penn Hill. Mark had spent six years away from Dorset in senior management positions in the hospitality and leisure industry in London, before returning to start work on his Urban vision. Mark is wild about wildlife and our natural environment. He’s a well-known figure having been a Hengistbury Head ranger since the Iron Age (Or at least for the last 30 years). Him and a colleague, Stuart Clark, led on the development and fund raising of the fantastic new Hengistbury Head Visitor Centre and was also responsible for introducing our cattle which help to manage the heathland. Mark is the foundation’s legal guardian being a director of Rawlins Davy Solicitors and Mediators, one of Bournemouth’s oldest law firms. Specialising in regulation and compliance, he has a wealth of knowledge in the legal arena and from 29th April 2019 takes the role of President of the Bournemouth and District Law Society. He moved to Bournemouth from the Midlands 15 years ago and still pinches himself every morning that he lives this close to our wonderful parks and beaches. In his day job Michael is Parks Development Manager with Bournemouth Parks and has worked for Parks for over ten years. He’s a great believer in outdoor education and has vast experience in countryside access development in both Dorset and East Sussex. In his spare time he volunteers with the National Trust and lives locally in Queens Park enjoying bringing up three children with his wife Louise. He actively enjoys playing sport, a spot of gardening and really wild places. John moved to Dorset two years ago but has had family connections in the area since childhood. He is a qualified accountant who worked in local government finance for over 35 years. His last job before retirement was Head of Finance at a unitary council in Berkshire. He has had a strong interest in wildlife all his life and is a member of the RSPB and the RHS. John is a keen photographer and is also a Freeman of the City of London. Jacky is a professional writer and communicator and heads up her own copywriting and editing company – Wordsmith Services – as well as being Development Manager for Dorchester Arts Centre; and working extensively on projects boosting Dorset’s cultural tourism. She worked for many years for Bournemouth Symphony Orchestra; and also for Bournemouth’s National Coastal Tourism Academy as its Visitor Experience Manager. Cathi manages the day-to-day running of the foundation doing anything from fundraising, marketing, project management, finance to volunteer coordination. Having previously worked in Bournemouth University's marketing department she brings a wealth of marketing experience to the team. Passionate about all things sport, Cathi plays touch rugby for England (albeit the masters team!) and enjoys Crossfit. Peter leads our new and innovative Parks in Mind project – delivering nature conservation, arts and wellbeing activities in Bournemouth’s beautiful parks and open spaces to benefit the people taking part. Peter comes from a nature conservation background, employed for many years managing nature reserves in the conurbation. As part of this work, he has always tried to find ways to involve communities in the care of their local open spaces. As well as his interest in wildlife and people, Peter has keen interest in the arts and is a long-standing supporter of his local football team, AFC Bournemouth. Up the cherries!